We are often asked about allergic reactions and hedgehogs. Many potential customers want to know whether or not hedgehogs are good pets for someone who is allergic to cats and dogs. A quick search on the internet will uncover a variety of answers to this question. Hedgehogs are often sought out as an alternative pet for individuals who are allergic to cats, dogs and/or other pets. Although hedgehogs may be a good pet alternative for individuals who are allergic to cats and dogs, according to an article titled “Hedgehog Hives,” the presence of allergies to other pets may be predictive of hedgehog hives. Therefore, hedgehogs are not, per-say, 100% hypoallergenic. It is always a good idea to visit a hedgehog prior to purchase if you are allergic to other animals and want to make sure you are not allergic to hedgehogs as well. Allergy symptoms can vary between each person and various animals. Many people with mild allergies can handle hedgehogs. Hedgehogs may elicit the same types of allergic responses, as other types of pets and allergens do. Several people have told us that they owned a hedgehog (or multiple hedgehogs) for quite some time when they suddenly developed sensitivity to their pet. The most common skin related allergic reaction is the development of skin redness with some type of white or red bumps. Another type of allergic reaction is watery eyes, runny nose, and sneezing. Asthma related symptoms such as wheezing, restricted breathing, etc. may be induced in severe cases. Reactions may develop only when in direct contact, only while cage cleaning, or only when poked. It is possible to have red prickle marks on your hands after handling a hedgehog without being a significant allergic reaction. It is fairly common for small red dots to develop on forearms after handling a pokey hedgehog against bare skin. People with sensitive skin are more likely to see small red bumps. One long-time hedgehog owner and rescuer, Lori Keller, shared with us that she has noticed that, the red prickle marks greatly reduce after giving the hedgehog a bath. Apparently, when dirty hedgehogs make tiny pokes on your skin, the dirt is pushed into the skin and thus causes a reaction. The small marks tend to go away fairly quickly and can be avoided by keeping sensitive parts of the forearm covered with long sleeves when handling hedgehogs. 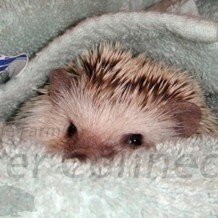 Another simple way to avoid prickle marks is to use a small blanket, towel, sleeping bag, etc. when cuddling your hedgehog outside of its cage. It is pretty obvious that hedgehogs do not have fur like most other small mammals. Most frequently hedgehogs are reported to have spines, which are often identified as hard hair. Dander is a common, animal-related allergy for many people. According to Webster’s Dictionary dander is minute scales from hair, feathers, or skin that may be allergenic. Cat dander is produced when saliva is deposited on the fur during the self-cleaning process. The dander turns into a fine dust. Many popular websites and sources such as http://www.faqs.org/faqs/hedgehog-faq/part3/section-6.html and http://en.wikipedia.org/wiki/Domesticated_hedgehog indicate that hedgehogs are dander free. The main reason cited is that hedgehogs have spines or hair rather than fur. However, this may not be true. We learned from the above sources that fur and hair are basically the same and hedgehogs do, in fact, produce dander. Moreover, hedgehogs can get dry, flaky skin similar to human dander. Many people allergic to small animals are actually allergic to the bedding. Most of the beddings are dusty, but hedgehogs can be housed on a variety of beddings that may help to eliminate a dust irritation. Bedding dust irritations can be especially bad if the bedding dust is pushed into the skin by a prickly hedgehog. People can develop allergies to hedgehogs (like anything else) over time. As per our knowledge there is no way to predict if an allergy is going to suddenly develop. As in the case of other animal allergies, the degree of allergic reaction can vary from person to person. Some allergy sufferers can combat their sensitivities simply by taking over-the-counter medications whereas those who develop severe reactions may need to find a new home for their pet. Most breeders will accept animals back into their homes should one of their customers need to find a new home for their pets.